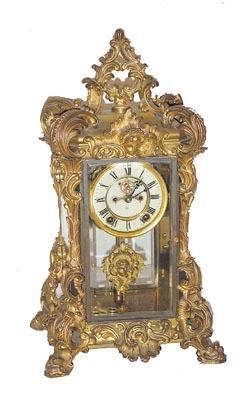 Ansonia Clock Co. crystal regulator, "Apex", ca 1905. One of their better and most collectable crystal regulators, along with the Regal and Excelsior. The 18 1/2 inch case is finished in original rich gold, still retains about half, with maybe a lot more under the tarnish and grime. The case has never been cleaned. The pendulum is correct. 8 day movement strikes on a gong, and it is running. Good 2 piece porcelain dial with open escapement. If you like it bright with new gilt, we\'ll be happy to supply you with the names of companies that will do it. Actually, most collectors seem to want it original even if some of the finish is worn. Ly-Ansonia, page 109.